Being one of the major container providers, we manufacture and export the collapsible metal container for the storage and transportation purpose. We offer a big range of metal container as per its applications. 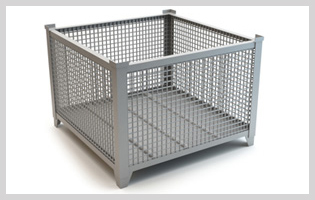 We make use of high grade material to fabricate the collapsible metal containers. Different kind of metals and alloys are used to make these containers as per need. It is also provided for the anti corrosive applications. Team of experienced and expert professionals has made us capable to fulfill all kind of requirements regarding collapsible pallets. Reinforced metal sheets and rigid welding joints provide ultimate long lasting capacities to our containers. These containers are completely collapsible and stacked one on one, which save spaces in store and warehouses of the products.